Somebody asked what would occupy my time once everything in the Scampy RV Team was perfect? That's a good question! And I've thought about that myself. I am going to educate myself. When I went to college, I was a terrible student! For some unexplained reason, I was not able to read more than a few pages of a book, without nodding off. Having this malady, is a non-starter for going to college. However, I just recently began subscribing to Amazon's Audible. Wow! I have no trouble like nodding off when listening to a book being read. Capital in the Twenty-First Century [Link]. 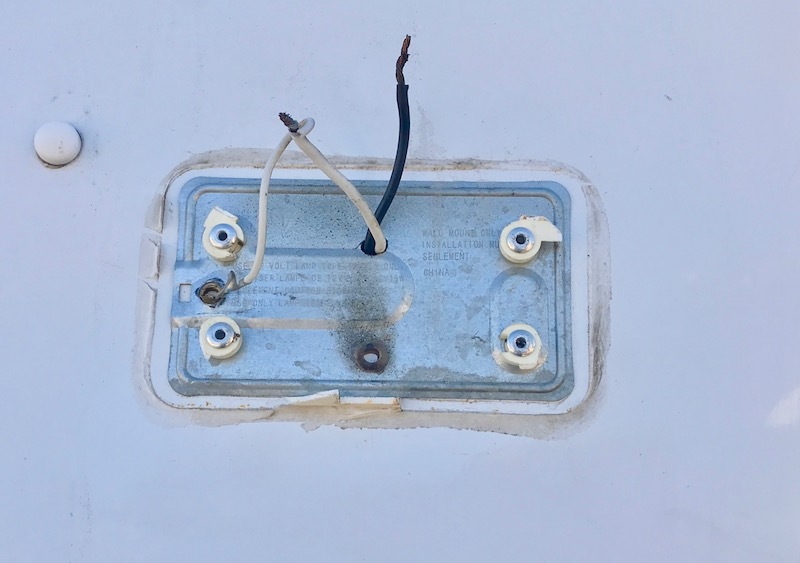 While the Scampy Team was still up at Lone Wolf RV Park, George towed Scampy so close to a tree that her porch light was scraped off. We have a replacement light and want to replace it this morning. Ex-wife Evie and Cousin Jacky both live in Laguna Woods. I've made dates with both of them. One for tomorrow. One for the next day. If the Scampy Team heads out now, we should miss heavy traffic. Wanna hear a Lock Story? You do?! Good, I thought that you'd never ask! When we went to buy Scampy's new door lock, we found that the price was terribly cheap. We thought, "Good! Better a cheap price as long as the quality of the door lock is very good!" When the lock arrived, inspection showed it to be good quality. Of course, you know Tioga George! He has to take stuff apart. See how things work. When the lock was being taken apart, an inside cover plate was removed. Whoops! The inner-workings leaped out. Oh, no! But we seemed to find all the parts. Actually, we found all the parts except for one part. 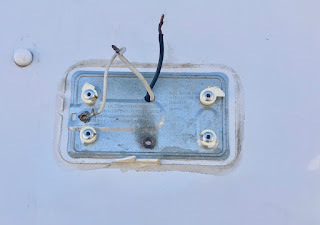 That part connects the door lock's key for the dead-bolt to the dead bolt. We found that we were able to engage the dead-bolt from the inside. But not the outside! We needed that missing part for that! When we had the lock factory on the phone, it became clear that this was NOT the factory, as their web presence represented the company to be. Only a web-based store pretending to be a factory. The actual factory is located in China [So many are!]. In order to obtain the missing part, a new door lock must be purchased. Only cost $25 bucks for another lock! So, we ordered it. We'll probably receive it this coming Friday. Are you using and or changing to LED's? Yes, I've changed out all the lights that arrived with Scampy to LEDs. Don't waste any time thinking about what you'd do when everything is perfect. No one that owns an RV, or a home, ever runs out of things to do. Keeping up with them is the challenge. OK! I won't waste any time on that subject anymore! I could have worded that better. Instead of "don't waste any time," I should have said, "You don't have to worry about not having anything to fix or tweak." Wherever you are officially a resident, has a public library. Most public libraries have an extensive collection of free on-line books, videos, classes you can take, magazines, on and on. Check it out. All you need is a free library card. PS: Your not Mister ed, are you? I am not the talking horse. You know that about me, huh? You know something, Rita? I was looking at a Blog post of mine from the time when my Son David died. And saw your comment there. Yes George I'm been a reader before David died. I cried too when he died...I still get teary eyed thinking about it. May he rest in peace. So, George, any guess on your total blogging income? You think Facebook etc. Would cut into blogging audience? I commented earlier to you that what you were asking was, "Wait and see pudding." Not that you were my pudding. Oh my, Phun! Getting pretty personal in wanting to know about my income?! I'm another ( mostly silent) follower from almost Day One. My favorite time was when you were camped by Little River in Mexico. It was a peaceful period. Yes, those were good times for me too [At that time!]. Of course, I had no clue of the disastrous events that were ahead for me during September, 2010! My Son David would take his own life!! And my own life would spiral out of control. You know something, Suz? It would be a terrible curse for us to know what our future held for us. I would NOT want to know the future. Best that our future wait for us to come into it in the old fashioned way. Second by second. My blogging income=0. I am no celebrity as yourself. I just thought if you stated your income from blogging all those years you would be an incentive to all those other RVrs wanting to be millionaires. Yes, you may be correct that being aware of others Google AdSense income might be an incentive, as you comment. You should know, that making money like that is very, very difficult now. Years ago, when there was MUCH less competition for earning web income, nearly everybody who tried it did well. Those times are gone, gone, gone. In addition, I would NOT wish to be even remotely responsible for suggesting to Readers that they might do well pursuing Googlle's AdSense at this time. I suspect many of us have been reading your blog for years (I found you very early into the Mrs Tioga days). All of the people and places we've been introduced to. The many families you made friends with in the various towns of Mexico, the Lewis and Clark trail, the trip into Canada and then down to the Southern border of Mexico. Michel the photographer (still miss his blog), and all of the others. Your trip to Israel. What an adventure it has been, and we all appreciate being able to journey with you. We grieved with you (and for you) when David chose to leave us. I'm thrilled to see you living life again and look forward to more adventures. Just a passing thought... Whatever happened to Pussel the cat? I am very impressed with your memories in this comment! Wow! Better than my own memories! Pussel E. Cat passed away. Would you care to see a pic of my Son David and Pussel? Click [Here] to go to one of my Blog posts that contains a pic of Pussel with David.